SPACEPORT NEWS Page 3 August 18, 2006 Dowdell credits colleagues for Directors Award WILLIAM DOWDELL, chief of the Mission Management Office and technical operations director for payload launches, received the KSC Directors Award.By Linda Herridge Staff Writer W illiam Dowdell received Kennedy Space Centers highest honor, the KSC Directors Award, during the recent NASA Awards Ceremony. Dowdell is chief of the Mission Management Office and technical operations director for payload launches in the International Space Station/Payload Processing directorate. He received the award for outstanding leadership, significant contributions and dedication to the success of the International Space Station Program. I was very honored to receive this award, Dowdell said. But its also a reflection on the entire groups performance, including Boeings Checkout Assembly and Payload Processing Services and fellow ISS colleagues dedication to achieving success. Reminiscing about his quartercentury at KSC, Dowdell said he never dreamed hed be working for NASA. Coming to the Space Coast from his hometown of Fairmont, W.Va., was by chance. After earning a bachelors degree in biology and chemistry from Fairmont State University in 1979, Dowdell visited friends living in Cocoa Beach. He applied for a job at Management Services Inc. (now Wiltech) and was hired as a chemical analysis technician. In 1982, Dowdell returned to his home state and earned a Bachelor of Science degree in Chemical Engineering from West Virginia University in 1985, then returned to Florida, hooked on the space program. He worked for Lockheed Space Operations Co., in environmental control and life support systems, from 1985 to 1989 and was then hired by NASA. Dowdell worked in the Test Directors Office beginning in 1989 and was a shuttle test director from 1994 through 1996, before transferring to space station element processing. In the Space Station Processing Facility, Dowdell worked on station elements including the Zenith 1 (Z1) truss for mission STS-92 that launched on Oct. 11, 2000, and the power module (P6) for mission STS-97 that launched on Nov. 30, 2000. For P6 processing, Dowdell traveled to California to work with Rocketdyne and Boeing. He also worked with Lockheed and Loral Space Systems and led the qualification test programs for Z1 in Seattle and P6 in Denver. Working for Norm Carlson, and later Mike Leinhart in the Shuttle Processing Directorate made it very easy in my current job to integrate the space station work effort with the shuttle operations integrated flow, Dowdell said. In his current position, Dowdell is responsible for space station hardware integration and performing final flight test and assembly in the facility prior to delivery to the station. He also ensures that cost, schedule and technical issues are resolved. Russ Romanella, director of Station/ Payload Processing, said Dowdells insight into ground processing of human space flight vehicles is unsurpassed. Dowdell works with other agency centers, Boeing Design Centers in Canoga Park, Calif., and international partners, such as the European Space Agency for the Nodes 2 and 3 and Columbus module processing and the Japanese Aerospace Exploration Agency for the Japanese Experiment Module. We are building a one-of-akind laboratory in space, Dowdell said. The technology and its robustness will be a huge help to the agency as we prepare to go to the moon and Mars. And I hope well be able to use the station to the full extent of its research capabilities to improve the quality of life here on Earth. Exploration Park aligns industry with NASA visionCENTER DIRECTOR Jim Kennedy talks to company officials interested in the new Exploration Park.K ennedy Space Center recently hosted an industry day briefing and a tour of NASAs new Exploration Park site. Representatives from prospective commercial developers, engineering and construction firms, economic development organizations and a variety of technology and space-related companies attended the briefing on Aug. 10 at the KSC Visitor Complex Universe Theater. The event was part of NASAs effort to solicit offers from the private sector for the development and long-term operation of Exploration Park. According to Jim Ball, KSC spaceport development manager, growth of the park will advance NASAs mission, help to open space to commerce and improve life on Earth. Ball said the park is expected to attract tenants engaged in space technology, commerce and education. Center Director Jim Kennedy welcomed participants and expressed his excitement for the future of KSC. During this briefing, I hope you will learn how you may partner with us and we may partner with you for the success of our Vision for Space Exploration and the success of Exploration Park, Kennedy said. Kennedy said development of Exploration Park, located along Space Commerce Way behind the KSC Visitor Complex, is an opportunity for private industry to contribute and be part of the vision. Were all about building and launching rockets, and you develop and operate real estate, Kennedy said. We look forward to your contributions. Brevard County District 2 Commissioner Ron Pritchard greeted participants and said he was especially interested in working with NASA to make Exploration Park a success. Ball told prospective tenants he is looking forward to being able to accommodate them in Exploration Park. We have support from both state and local partnerships for this endeavor, Ball said. These include Fla. Gov. Jeb Bush and the state legislature, Enterprise Florida, the Economic Development Council of Floridas Space Coast, and other local government organizations and entities. Page 6 SPACEPORT NEWS August 18, 2006 Space leaders honor retirees for lifetime achievements By Jennifer Wolfinger Staff Writer M any space program leaders and legends gathered at the DoubleTree Oceanfront Hotel in Cocoa Beach on Aug. 8 for the National Space Clubs 2006 Lifetime Achievement Award ceremony. The clubs Florida Committee honored retired space program employees Sam Beddingfield, Francis Shill and J. Tall Webb. While the crowded room enjoyed lunch, local musician Chris Kahl sang Rocket Boys, a song he wrote for the honorees. The song can be found on his CD Orange Blossom Memories. Chairman of the Board Adrian Lafitte of Lockheed Martin praised the award recipients. Were here to celebrate three individuals that have dedicated and been an advocate most of their lifetimes to the space program, he said. Beddingfield retired from NASA in 1985 after a 26-year career with the nations space agency. He joined NASA at the insistence of Gus Grissom and came to Florida in 1959 to help guide Project Mercury. He was among the first to work on the space shuttle at Kennedy SpaceFRANCIS SHILL (left), Sam Beddingfield and J. Tall Webb display their 2006 Lifetime Achievement Awards received Aug. 8 from the National Space Club Florida Committee.Center and left the program as deputy director of shuttle operations. He continues to be involved in space history initiatives and resides in Titusville. Beddingfield shared that he was one of just 33 employees at the spaceport; when employees were assigned numbers, he was number four. I had worked through 23 launches and decided enough was enough, he said about his decision to end his exciting career. Shill worked as a contractor on the Eastern Range for more than 40 years and retired in 2004 as director of the Range Technical Services Contract for the U.S. Air Force 45th Space Wing. A former National Space Club Florida Committee board chairman, he resides on Merritt Island. Shill said his favorite moments were working on the Range as opposed to the management side, and that it was much easier during his early career because the many programs had adequate funding. The belief in the ability to get the job done if you try hard hasnt changed in 35 years, he added. I cant think of a better calling to spend the past four-plus decades of my life. Thirty-nine years of experience allowed veteran aerospace manager Webb to work on every U.S. manned space program. Webb retired in 1998 as director of support operations and systems management for United Space Alliance. The local chapter of the American Society of Mechanical Engineers named its top annual award for Webb, who resides on Merritt Island. Webb said he loved getting up in the morning for work and making the long drive from Satellite Beach, because he could think about what he had planned for the day. He also enjoyed the teamwork, but said he valued his home team most. Theres nothing more interesting or more worthwhile to work on, he shared. Each year, the committee recognizes one to three people for lifelong achievements and contributions to the U.S. space program. Nominees come from government, military, commercial or government contractor organizations. They may be retired or currently employed in continuous service for a substantial period. For information, visit http:// www.nscfl.org N ASA recently announced the award of launch services for the Lunar Reconnaissance Orbiter mission to Lockheed Martin Commercial Launch Services of Littleton, Colo. The total cost of launch services for NASA, which includes spacecraft processing and associated mission integration services, such as telemetry support and mission-unique items, is $136.2 million. The spacecraft are scheduled for launch aboard an Atlas V 401 rocket from Complex 41 at Cape Canaveral Air Force Station during a launch window that opens on Oct. 31, 2008. The launch service was awarded in support of the NASA Launch Services Program office at Kennedy Space Center. The orbiter will spend a year mapping the moon from an average altitude of approximately 30 miles. It will carry six instruments and one technology demonstration to perform investigations specifically targeted for preparing for future human exploration. The instruments are provided by various organizations throughout the United States, NASA awards launch services for 08 lunar mission and one is from Russia. The mission is also carrying a secondary payload called the Lunar Crater Observation and Sensing Satellite. Its goals are to confirm the presence or absence of water ice at the moons south pole. NASAs Goddard Space Flight Center in Greenbelt, Md., manages the orbiter project, and the agencys Ames Research Center in Moffett Field, Calif., manages the sensing satellite project. Principal work for tank manufacturing of the Atlas V first stage booster will occur at the Lockheed Martin facilities in Waterton, Colo.; tank fabrication for the Centaur upper stage will occur at the Lockheed facilities in San Diego; assembly and testing of the launch vehicle components will occur at the Lockheed aeronautics plant in Denver. The fabrication and assembly of the payload fairing, the interstate and its associated adapter will be performed by Lockheed in Harlingen, Texas. SPACEPORT NEWS August 18, 2006 Page 7 Remembering Our Heritage30 years ago: Highly successful Viking 1 mission first to land on Mars A PARACHUTE system (above), designed to carry an instrument-laden probe through the atmosphere of Mars, was tested in the Vehicle Assembly Building. Full-scale parachutes, 12 feet in diameter, with simulated pressure vessels weighing up to 45 pounds, were dropped from heights of up to 450 feet to the floor of the building. At right, the Titan IIICentaur carrying the Viking 1 Lander lifted off on Aug. 20, 1975.By Kay Grinter Reference Librarian T hirty years ago, NASAs Viking 1 and 2 landers made history as they touched down on the surface of Mars intact, the first probes to successfully soft-land on another planet in our solar system. A primary goal of the Viking Project was to determine whether life existed on Mars through onthe-spot biological tests. Each mission consisted of an orbiter, built in-house at the Jet Propulsion Laboratory, and a Martin Mariettabuilt lander. The lander was designed to slow its descent to the Martian surface by deploying a parachute which would be discarded at about 3,900 feet. Three radar-controlled, liquid-fueled engines would then lower the spacecraft to the ground at a speed between 5 and 11 feet per second. The launches were planned 10 days apart during Earth/Mars opposition, which occurs about every 26 months. Since there was only one pad at Launch Complex 41 to support the projects Titan-Centaur rockets, an unusual processing schedule was devised. The vehicle for the second Viking mission was checked out at the pad ahead of the vehicle slated to launch the first spacecraft. Preparations on the second vehicle continued in nearby facilities while the vehicle for the first mission was installed on the pad for the final launch campaign. NASA alumnus Jack Baltar was the test operations manager for Unmanned Launch Operations and was responsible for the launch readiness of both the vehicles and the pad. From his home on Merritt Island, he recalls, The short time period between the launches put pressure on the team, but we were up to the challenge. Viking 1 launched Aug. 20, 1975. There was minimal damage to the pad, allowing Viking 2 to launch 20 days later on Sept. 9. About a year after its launch, the Viking 1 lander separated from its orbiter and touched down safely at Chryse Planitia on July 20, 1976. Its historic first image was transmitted 25 seconds later. Following close behind, the Viking 2 lander touched down at Utopia Planitia Sept. 3. Originally designed to function a mere 90 days, the Viking spacecraft collected data for more than six years. The landers took 4,500 close-up images of the Martian surface and more than three million weather-related measurements, including the first in situ observations of a global Martian dust storm. The orbiters took more than 50,000 images, mapping 97 percent of the planet. Among the memorabilia displayed on the walls of Baltars home is a photo he treasures from his career at Kennedy Space Center: an image of the Martian landscape inscribed to him by Viking Project Manager Jim Martin of NASAs Langley Research Center. It reads: Your fine work on the Viking TC-3 made this picture possible. Thank you. E ighteen college students were each recently awarded a $10,000 scholarship through the Astronaut Scholarship Foundation. The group of 60 astronauts chose students who exhibited exceptional performance in the science or engineering field of their major. The recipients were notified of their scholarship for the 2006-2007 year through a personal letter from the astronauts. Our goal is to inspire renewed interest in science and engineering careers here in the United States, said Astronaut Scholarship Foundation Chairman and Apollo 15 astronaut Al Worden. We are committed toAstronaut Scholarship Foundation awards 18 college grantsencouraging the next generation of explorers. Our nation is strongest when we lead the world in innovation and invention. Scholarship candidates are nominated by faculty members and reviewed by a board at 18 cooperating educational institutions. Two nominees from each school are submitted to the foundations committee. The selections are presented to the groups directors for final approval. The foundation has awarded more than $2.3 million in scholarships to 211 students nationwide since 1985. For a complete listing of the scholarship winners and information, visit www.AstronautScholarship.org. 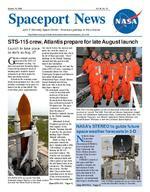 Page 8 SPACEPORT NEWS August 18, 2006 John F. Kennedy Space Center Managing editor. . . . . . . . . . . . . . . . . . . Bruce Buckingham Editor. . . . . . . . . . . . . . . . . . . . . . . . .Jeff Stuckey Copy editor . . . . . . . . . . . . . . . . . . . . .Corey Schubert Editorial support provided by InDyne, Inc. Writers Group.NASA at KSC is located on the Internet at http://www.nasa.gov/centers/kennedyUSGPO: 733-049/600114 Spaceport News Spaceport News is an official publication of the Kennedy Space Center and is published on alternate Fridays by External Relations in the interest of KSC civil service and contractor employees. Contributions are welcome and should be submitted two weeks before publication to the Media Services Branch, IDI-011. E-mail submissions can be sent to Jeffery.Stuckey@ksc.nasa.gov.Kennedys work force has a Deep Impact on NASA missionRICHARD GRAMMIER, Deep Impact project manager from the Jet Propulsion Laboratory, spoke to KSC employees Aug. 9 about the successful mission. At right, rising from the flames and smoke beneath it, NASAs Deep Impact spacecraft lifts off Jan. 12, 2005, from Launch Pad 17-B at the Cape Canaveral Air Force Station.By Jennifer Wolfinger Staff Writer T he Deep Impact spacecraft might be in sleep mode after an exhausting assignment, but the missions team members arent hitting the snooze button. On Aug. 9, Project Manager Richard Grammier of the Jet Propulsion Laboratory presented a mission overview to spaceport employees on the scientific results received to date. Deep Impact is the first mission to probe beneath the surface of a comet and reveal the evolutionary changes of its interior. The spacecraft launched from Cape Canaveral Air Force Station on Jan. 12, 2005, aboard a Boeing Delta II rocket. It traveled approximately 268 million miles to collide with Comet Tempel 1 on July 3 of that year. You deserve to see the results of your hard work, Grammier said to the KSC team. He described the anatomy of the spacecraft and comet, the different comet orbits and the missions objectives. The two-part spacecraft comprised flyby and impactor portions. The battery-powered impactor was released into the comets path to collide with it. The impactors camera captured and relayed dramatic images of the comets nucleus seconds before impact. The flyby spacecraft recorded the impact and the materials that were blasted upward. Comets are the building blocks of our solar system, Grammier said. They are time capsules that preserve the original foundation of our solar system. He said 400 tons of interplanetary material impacts the atmosphere each day. Theyre usually small, with the basketball-size (material) impacting about once a week or month, car-size about every six months and the bus-size every few million years, he said. Comet Tempel 1 was selected as an optimum target because it made many passages through the inner solar system, orbiting the sun every 5.5 years. A comets composition includes primitive debris from the solar systems distant and coldest regions that formed 4.5 billion years ago. About 4 billion years ago, the Earth encountered a heavy bombardment period and couldnt retain an atmosphere to allow life to develop. Life began to form once conditions allowed for it after this period, he explained. In February, scientists detected ice on Comet Tempel 1, marking the first time this was discovered on the nucleus of a comet. Another exciting discovery was that the comet produced six outbursts during six weeks, which had never been seen on a comet. We concluded that as it rotated into the sunlight from darkness, it would heat up and gases would off-put, Grammier said. The spacecraft, which is awaiting a possible wake-up call for future research, is on a trajectory to fly past Earth in late 2007. For more information, visit www.nasa.gov/mission_pages/ deepimpact/main/index.html M ake your plans now to celebrate one of the many reasons that Kennedy Space Center is special at the 2006 Diversity Event from 6:30 p.m. to midnight Sept. 9 at the Radisson Pavilion in Cape Canaveral. With the theme, Diversity: A cord of many strands is not easily broken, the event will feature guest speaker Tish Sheets, director of diversity and special projects for NASCAR. Tickets cost $25 and can be purchased from the Office of Diversity and Equal Opportunity, HQ Room 2327, or from the following people: Lisa Arnold, Headquarters fourth floor, 867-7246; Linnette Daniels, Hangar N (cape side) room 200, 853-9261; Maxine Daniels, Space Station Processing Facility, room 3228X, 867-5976; Agnes Vargas, Operations and Checkout Building, room 1056, 867-3004; and Latasha Walker, Logistics building, room 2710F2, 861-7439. 2006 KSC Diversity Event celebrates traditions THE 2006 Kennedy Space Center Diversity Event at the Radisson Pavilion in Cape Canaveral begins at 6:30 p.m. on Sept. 9.